The number of children and teenagers under 18 who are being treated for drugs such as heroin, cocaine or ecstasy dropped by more than two-thirds over the last five years, figures have shown. The number of young people in England being treated for Class A drugs fell to 631 last year from a peak of 1,979 in 2006/07, the National Treatment Agency for Substance Misuse (NTA) said. But experts warned that stronger strains of cannabis may be partly to blame for an increase in the number of cases involving youngsters seeking specialist help for the drug, up 3% to 13,200 from 12,784 last year. 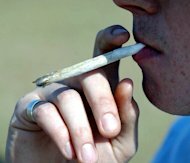 With evidence suggesting that overall young people's cannabis use was declining, the rise "could be down to a combination of stronger strains of the drug causing more harm", greater awareness, and specialist services being more alert and responsive to the problems the drug can cause for under-18s, the NTA said. Nine out of 10 of the 21,000 young people accessing specialist substance misuse services in 2011/12 were seeking help mainly for cannabis or alcohol, the NTA figures showed. But the proportion of young people successfully completing treatment for drugs was up, rising to 77% last year from 50% five years ago. Rosanna O'Connor, the NTA's director of delivery, said: "Any substance misuse among young people is a cause for concern. The signs that fewer need help, and that a higher proportion are successfully completing their programme of support, is encouraging. "In the current climate of increased pressure on local authority funding, these figures give a clear message that any disinvestment in young people's drug and alcohol programmes will be detrimental." She went on: "The numbers needing specialist interventions remain low and evidence shows that fewer young people are using drugs. However, the advent of new substances and risks of ongoing cannabis and alcohol use in particular present a significant challenge." Overall, the number of young people accessing specialist substance misuse services was down for the third year running, falling to 20,688 from a peak of 24,053 in 2008/09, the NTA said. The number of young people seeing specialist services for alcohol also dropped, down to 5,884 from 7,054 last year, the NTA figures showed.